Jane Goodall’s Good for All News shares the stories of the many positive advances being made in the world for protecting wildlife — especially chimpanzees — and how every individual can do their part to make a difference for a better world. 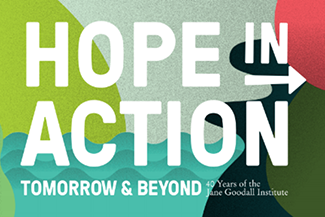 The stories and information shared on Good for All News are guided by Dr. Jane Goodall’s Reasons for Hope. With so much global media focused on doom and gloom, our stories, emphasize why we should continue to embrace hope, and inspires us all to take action. Good for All News brings stories and information written by Dr. Goodall herself, as well as the staff of the Jane Goodall Institute and members of the wider wildlife conservation community.